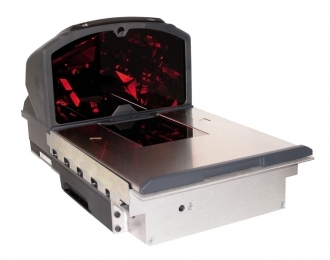 The StratosH is a bi-optic in-counter scanner that can automatically read scans from all sides of a product without the user having to reposition the item. For all kinds of retail needs, in particular for grocery sales, you can get the StratosH with and without an integrated scale. Well-known scale manufacturers are all at your disposal for meeting the most diverse applications. The scale option is also available as a supplemental connection, with which you are perfectly equipped for meeting future needs. Thanks to its patented modular design the scanner is easily and quickly installed, requires only minimal maintenance time and thereby provides maximum customer service. Due to its design and a smaller installation depth of only ten centimetres, it has ideal ergonomic integration in all common checkout environments - whether sufficient or little space is available, or the cashier is standing or sitting. The six-sided bar code reader scans all 1D as well as RSS codes, and guarantees rapid 360 scanning with 5,280 scan lines per second. In combination with the StratosSPHERE decoding software, the scanner achieves high capture rates, even with badly printed, damaged, or ripped bar codes. As a result, higher throughput can be handled effortlessly even in particularly demanding situations. A two-digit digital display provides a clearly assignable defect code in case of malfunction, at which point an immediate defect analysis should be conducted. Simultaneous scanning and concurrent deactivation of the security tags poses no problem with the integrated EAS deactivation antenna. Updates are possible via FlashRom. Like the StratosE, the H series supports all standard interfaces, such as RS232, IBM and USB. A change in the check-out hardware does not require the replacement of the scanner, but rather only the replacement of the cable and configuration. Moreover, the scanner has a supplementary auxiliary port where, in order to increase flexibility in the check-out area, an additional hand-held scanner can be connected. Further efficiency is provided by the integrated EAS deactivation antenna - simultaneous scanning and concurrent deactivation of the security tags saves you valuable time.